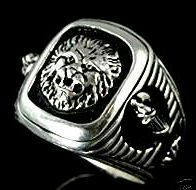 Roman Lion,Fasces Signet ring,,,Sterling Silver,Lge. 7 day Money back satisfaction GUARANTEED. Started in the Jewelry business in 1972. It's one of the few jobs were you can be involved in the process from begining to finish. No two days are the same.You are dealing with a product with intrinsic value,asthetics as well as historical significance.Practical as well and off the wall projects.As a jeweler/modelmaker I have had projects that were as involved as having to make sunglasses with a mini CCTV camera hidden behind the bridge for the US Secret Service to Kickass Biker Skull jewelry were I have been a leader for over 25 years. Other work that has come across my bench has been classic Tiffany type diamond designS, as well as miniatures for the toy industry,figurines for the Pewter market,and models for film props.
. Double your traffic. Get Vendio Gallery - Now FREE! A Masterpiece of craftsmanship an Emperor would wear! !